Cameras and other photo products with the brand Vokar were produced by Electronics Products Manufacturing Corp., located in Ann Arbor, and then Dexter, Michigan, USA. The company is mainly known for its rangefinder camera, ambitious and handsomely styled, but ultimately a failure. 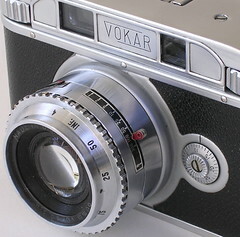 Many sources (including earlier wiki articles) have stated that the Vokar brand was created by Charles Verschoor, who was ousted in 1938 as president of the company who made Argus cameras. However there is little documentary evidence to support this. The confusion may be caused because Electronic Products Manufacturing was founded in January, 1939 by a different ex-Argus man, Robert P. Wuerfel. The first location advertised for Vokar products, 208 W. Washington St., was a mere 1/3 mile from the Argus factory. In 1943, the company registered a move to a new address at 7300 Huron River Drive, Dexter Michigan (a move of roughly 8 miles west). In 1945 the company name itself became Vokar. By late 1939, Electronic Products Mfg. began marketing photographic products using the brand name Vokar . The original Vokar camera was a simple plastic-bodied folder for 6x6 exposures on 120 film. This appeared with different lenses & shutters and in slightly different styles. Electronic Products also introduced several slide projectors, one in bakelite and two in "streamlined" metal. Despite the grandiose name, the latter used an inexpensive folded-steel case. This was also sold by the Sears chain under their Tower brand, and was apparently one of the firm's more successful products. The company also advertised a kit of dodging and vignetting tools for use when making prints, and a coating that was claimed to heal scratches in negatives. At some point, EPM engaged Richard H. Bills to design a completely new and highly sophisticated 35mm rangefinder camera, and this is the model the Vokar name is best known for today. Development costs for the camera were said to run to some $250,000, but the design was to leap well ahead of the blocky C3 rangefinder that Argus was now manufacturing. In 1943, the company relocated to more rural environs outside Dexter, Michigan. During the World War II period, Electronic Products Mfg. Corp. converted entirely to defense contracts, making parts for proximity fuses. Sales of the simple bakelite folders ceased. But 6x6 folders similar or identical to Vokar's models were sold by Camera Specialty Company of New York City under the Voigt and Wirgin names; the exact relationship between the two companies remains to be clarified. In 1945 the Electronic Products Mfg. turned its attentions back to the photography market; and in its December magazine advertisements, it now carried the name "Vokar Corporation" The ads also included a tantalizing note: "Watch for Announcement of the New and Finer Vokar Camera." This was the long-awaited Vokar I rangefinder, which was finally advertised in January 1946—only to disappear for another 9 months, again replaced by the teaser "watch for announcement… ". Finally, in the fall of 1946, advertising for the Vokar re-appeared, and now quoting a price—suggesting the camera was at last available. The ambitious camera had its share of teething troubles, and the undercapitalized firm failed to make much of a dent in the US camera market. Despite a modest 1948 revision, the Vokar II, the company sank from view (and returned to electronic products). The final dissolution of the company is recorded in 1964, but its participation in the photography market had ended much earlier. ↑ Articles of Incorporation for Electronic Products Manufacturing Incorporated signature and date page; public document obtained by Tom Kraycirik. ↑ Certified copy of resolution changing registered office and resident agent, public record obtained by Tom Kraycirik. ↑ Vokar advertisement noting the name change, Popular Photography (US magazine) December, 1945, pg.137. 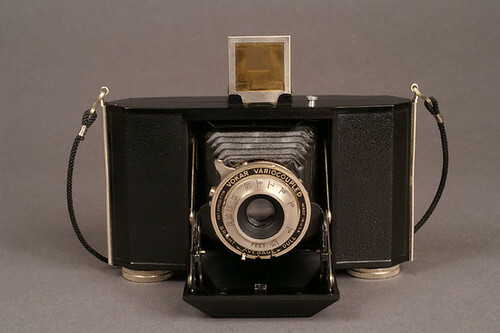 ↑ For example the Vokar A camera, advertised 1940, from Sylvain Halgand's www.collection-appareils.fr "Variocoupled Light Control" seems to have been been a primitive manual form of programmed exposure. ↑ "Available Now — The New Streamlined Vokar Projector" (advertisement) Popular Photography November 1945, pg 121. ↑ Vokar advertisement in Popular Photography, December 1945, pg. 137. This page was last edited on 15 June 2017, at 05:26.